The definition of comfort food, this baked macaroni and cheese recipe has a delicious, crispy topping. Perfect for Friday meals during Lent, or anytime you want an easy and filling meal. Makes a great side dish too! Baked Macaroni and Cheese. For any Catholic kid growing up in the 60’s and 70’s, it was the go-to Friday night dinner. It’s also the definition of comfort food. I am ashamed to admit that when my kids were growing up, I didn’t make this. I know…I really owe them an apology. I made the blue box Kraft Macaroni and Cheese. Both of my kids loved it and it was something I knew they would always eat. Plus it was easy and fast. 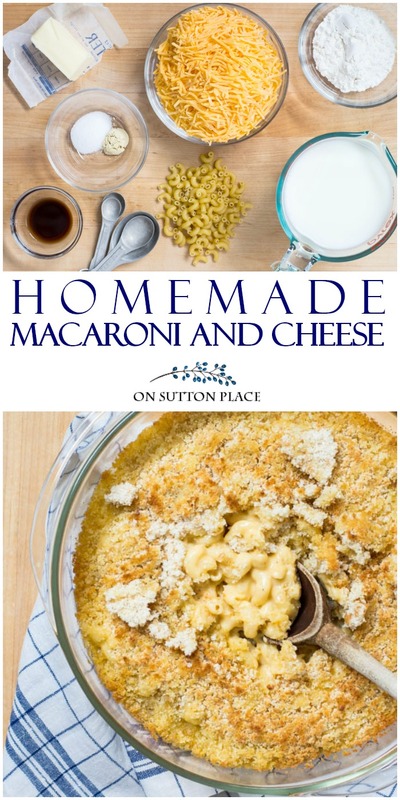 A few years ago, when I started cooking for my parents, my Dad asked me to make my Mom’s macaroni and cheese recipe. I took her recipe and combined it with one from a friend. This combination of recipes is what I make now. I added the fresh bread crumb topping, but it’s an optional step. It adds a lovely crunchy texture and only takes an extra minute. When my mom made macaroni and cheese, she didn’t bake it. She served it straight from the stove top. When melted, add flour, salt, pepper and mustard while whisking. Add milk and Worcestershire sauce whisking constantly. Bring to a full boil while still stirring. Lower heat and add cheese. Stir in cooked macaroni. You want it to be a little soupy so you may not use all the macaroni. Pour into buttered casserole. Top with fresh bread crumbs. Drizzle with melted butter or olive oil. Bake at 375 degrees F about 30 min. It's done when the sides get bubbly and the top is light brown. During the season of Lent, this is a great Friday meal…although it’s not really much of a sacrifice because it’s so delicious. It is meat-less though so it fits the bill. 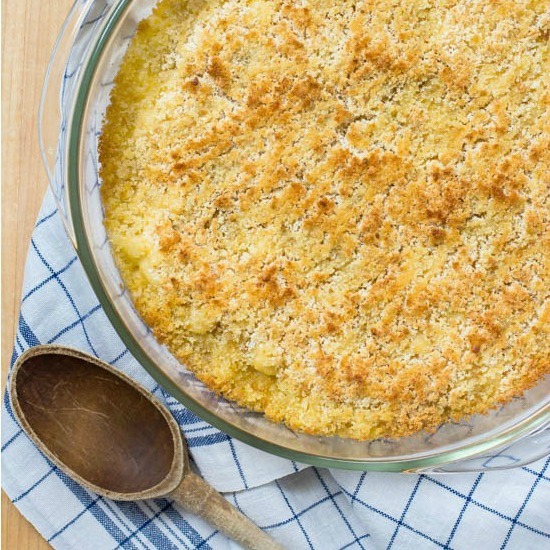 If you serve this baked macaroni and cheese as a main dish, it feeds 4 or 5. If you serve it as a side dish, it would feed between 6 and 8. I made this for my dad on Ash Wednesday and he gave it a thumbs-up. That’s always a good feeling! I just finished my first week of dedicated dieting for this year, and despite eating baked macaroni and cheese, I managed to lose a few pounds. I’m trying to find some balance, but even after all these years, I find it very hard. I’d like to still enjoy the foods I love, but I know I have to find some moderation…or balance. Whatever you call it, it’s not easy to find. 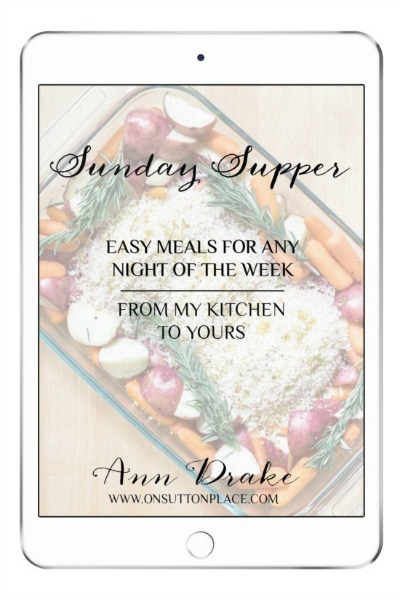 Want my free Sunday Supper eCookbook? Yuuuuum ! Nice job ! Going to make this soon ! Thanks ! Oh, my gosh, that looks SO yummy! Sadly, I cannot eat dairy not wheat. I do use a gluten free pasta and there is a pretty good non-dairy cheddar cheese that I ‘ve used. I don’t know if it would be good or not but it might be worth a try. I miss my mom’s macaroni and cheese. It was just macaroni, sharp cheddar, salt and pepper and milk and baked. I think I will give your recipe converted to non-dairy and GF a try. Thanks again for sharing one of your recipes. It sounds wonderful and as you mentioned, perfect for Lent! Looks like it might fit in a 3qt. casserole dish. I can’t wait to try it this Friday. That’s what I call comfort food! Thanks so much for sharing! Ah Ann this looks delicious! I have all of my Lenten Friday meal planning done. One was mac and cheese, so I will be trying your recipe. This Friday is tuna noodle casserole, of course with potato chip topping! Warm memories of meatless Fridays growing up, my Mom was so creative! I’ll fix your Mac & Cheese for dinner on Friday. Looks yummy! 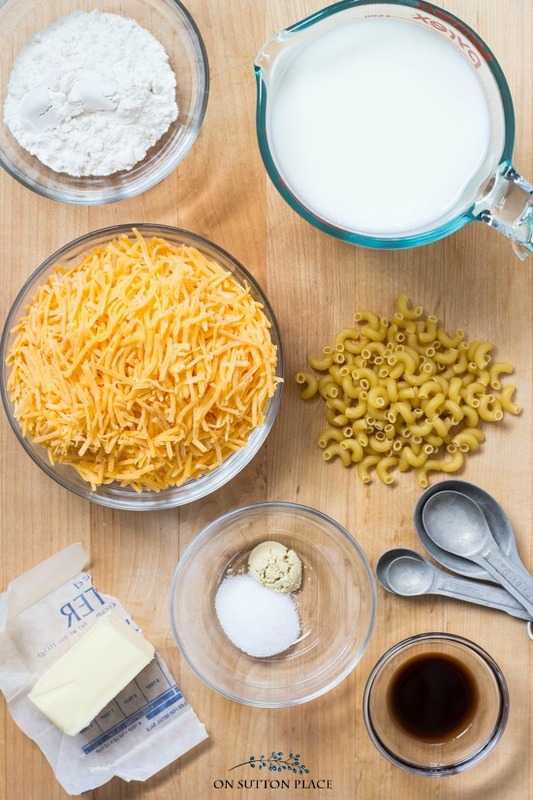 It is amazing to see how everyone makes the different versions of mac and cheese. I layer mine. Using angel hair pasta sharp cheddar grated, mix my milk and 1 or 2 eggs depending on size of dish, pouring some of milk mixture over, then layer again until dish is full ending with pouring last bit of milk and egg mixture. 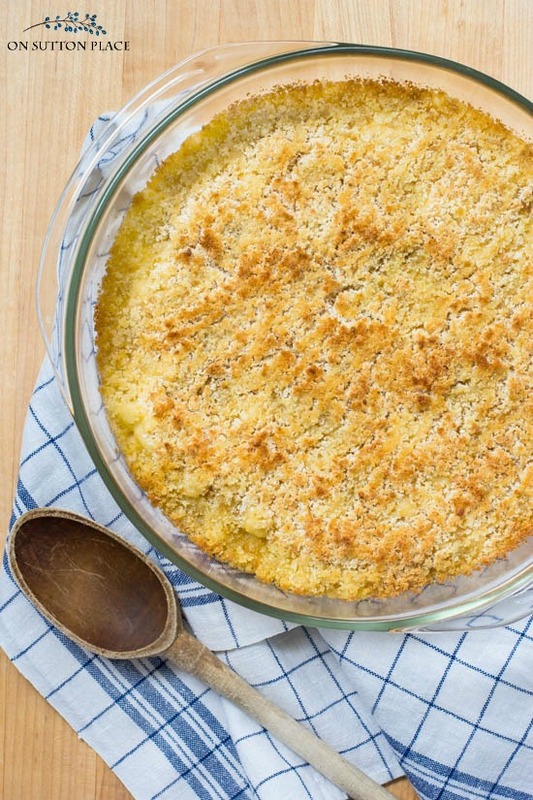 Top with bread crumbs or ritz crackers. Nake til brown and bubbly. Remove and let set a few mins. My family loves it. Love your blog and decorating ideas. Aha ! Someone who grew up using Ritz crackers. Do you know how to make stewed tomatoes with Ritz crackers ? When you are a kid, you think you will always have someday to learn the recipe and then one day it’s too late. No never made that. Sounds good though. I love both of those. It certainly is not easy losing weight when one is as good a cook as you are but you can do it. If one can eat slower it helps. Research has proved it takes the stomach 20 minutes to tell the brain it is full. Just keep your goal in front of you and you can do it. There is nothing like REAL homemade mac and cheese! Mine is similar but I have never added Worcestershire to it. I sometimes add crushed potato chips to the top instead of the crumbs if the kids are here. Thanks, Ann, I need to make this again soon and try adding the Worcestershire! I love homemade anything, but wonder about the topping on this?? Is there a way to make it but not have the topping? thank you! Looks wonderful….love my mac and cheese with stewed tomatoes on top! Will try this soon – thanks for sharing ! I would just like to say how refreshing your website is. It’s easy to following, clean, and not full of all kinds of nonsense. I have tried many of your recipes with full success and rave reviews. And your decorating ideas are now on my radar when shopping. I make a list of things to look for to get that “just right look”. Thank you so much for your insight and dedication to your readers. I look forward to opening my email every time I receive one from you. You are a true inspiration to those of us in a decorating delimma. Have a great day and keep smiling. Hi Dee…thank you so much for your kind words. They completely just made my day. Happy Spring! Your blog today brought back a sweet memory for me. When my daughter was about 11, she was invited to a friends home for dinner. She came home raving about the delicious macaroni and cheese they served. I had always made a recipe from my grandmother similar to yours, especially that little jolt of dry mustard. At their next soccer practice I asked the mom if she would be willing to share her recipe as my daughter loved it. She looked at me quizzically and said, “I just use the directions on the box”. So much for homemade. i made this recipe a couple of days ago. I used thin spaghetti in mine. I loved the taste. thanks for sharing ur recipe! This recipe looks so good, Ann! Have you ever tried crushed Ritz crackers on top? You blog, sew, decorate, garden, bake and you even cook for your parents. You are one amazing lady!!! Thanks for sharing! Yum! Am going to give this a try. We have several variations of mac & cheese and will add this to our list. Thanks again Ann. I look forward to your emails.!! I’ve never made mac and cheese from scratch for my son, either, Ann! It is one of my own favorite foods, and I am afraid I’d eat the entire thing! I am going to pin it for a day when I feel like splurging. It looks SO good! This is ultimate comfort food for the kids. And so easy to prepare: once you get a hang of it, it only takes minutes to put together (plus time in the oven, but in a pinch it can be eaten unbaked).! Once we had my son’s friend over for dinner, and I made a similar recipe for the kids, thinking– oh they are just going to gobble it up! But my son’s friend wouldn’t it, saying quietly, trying his best to be polite “I don’t like home-made macaroni and cheese” :) That was so unexpected to me, but kids do develop a taste to what they are accustomed to. I am sure your Dad loved every bit of this yummy Mac&Cheese, Ann! Totally yummy looking! 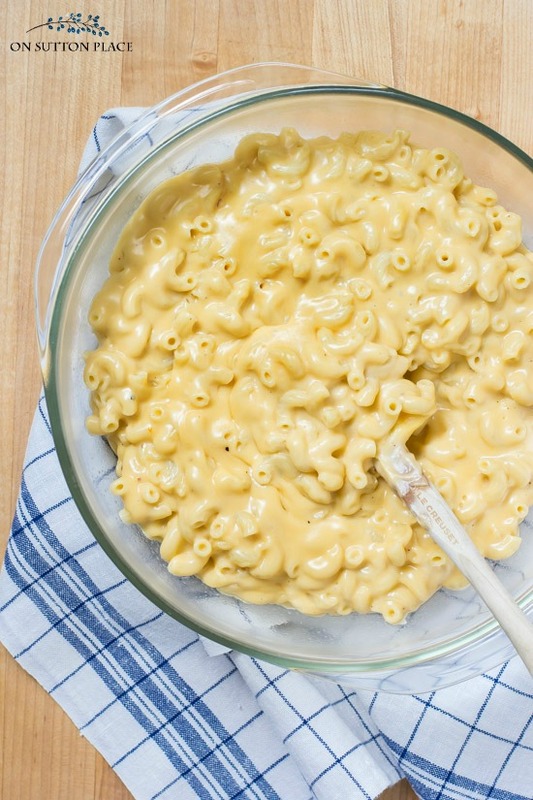 My grand kids love mac and cheese so I will make this for them. Thanks, Ann. Have to try this. If no winner, put me in. Love your blog. Wow! This looks delicious! The only homemade version I’ve made is in the crockpot, but this looks so much better! Thanks for the recipe! I love homemade mac and cheese. When my kids were growing up they wouldn’t eat the homemade version…they too liked the blue box one. After the youngest left home 20 years ago, I started making it from scratch again. I bake mine too. Yum! Looks great! I’ll be trying this out for sure! Here will be another favorite in our house! My boys still are talking about that chicken noodle soup! 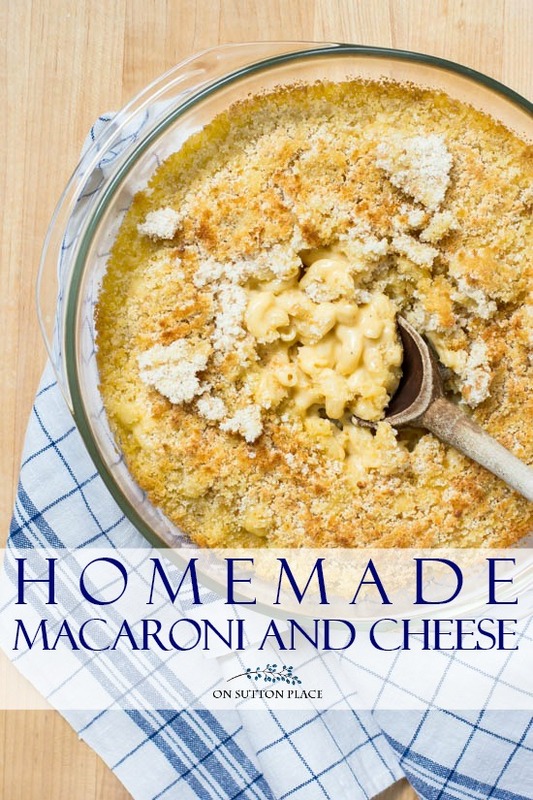 I’ve never made macaroni and cheese from scratch but this sounds delicious and looks pretty easy. Have a good weekend Ann! Oh my goodness, this is my favorite! YUMMY!